11 Famous Food of Allahabad for Foodie in You! Nostalgia, Taste, and Tradition these three words pretty much sum up the lip-smacking famous food in Allahabad - or should we say - Prayagraj? The holy land and the city of pilgrims and pilgrimages, Allahabad is undoubtedly among the top places to visit in India thanks to the Kumbh Mela that began in the city just a few days ago on the 15th January 2018. The city has always enjoyed a place of importance in Indian scriptures as it is situated at the confluence of the three holy rivers of India namely, Ganga, Yamuna, and the erstwhile Saraswati. It also plays host to the largest gathering of pilgrims and holy men called the Kumbh Mela, which is held once every 12 years. Thousands of visitors arrive in the city and it comes alive in all its colours. This is definitely the best time to enjoy the street food of the city! Round, flaky, tasty, and melt-in-mouth - the Kachoris of Allahabad have a certain charm to them that just cannot be expressed in words. As the age-old adage goes, one has to eat them to believe it. These balls of Urad Dal are filled with a spicy and tangy filling that goes perfectly with the Sabzi that they are topped with. The locals and numerous other netizens vouch for Netram Mulchand & Sons as being one of the places to savour local food in Allahabad. The best part about this offering on their menu is that the Kachoris are fried in Pure Desi Ghee, which lends them a flavour that is unique and sumptuous. Made from thick, creamy, delicious and fresh yoghurt, this Lassi in Allahabad should definitely be on your list of must-haves. The yoghurt is churned to rich buttery goodness until the cream froths up on top. Various sweet and fragrant flavourings are then added to it to impart a stunning and luxurious mouthful. The malai, i.e. cream on top, can be scraped off if you aren't too fond of it but we highly recommend drinking a glassful with the Malai intact. The lassi is mostly served in handmade clay cups that are eco-friendly and instil an earthy taste to the beverage. Raja Ram Lassi Waalaa is undoubtedly the best place to sample this creamy delicacy! What makes the glassful of goodness here unique, is that it is handmade and has retained its flavour for over 120 years! For the lovers of this rice delicacy, there is no place better than Eat on at Civil Lines. One of the budget places to eat at in the city, it is always crowded with foodies polishing off plates upon plates of delicious and spicy goodness. A hit among the locals, it has become an almost integral part of the local food of Allahabad. 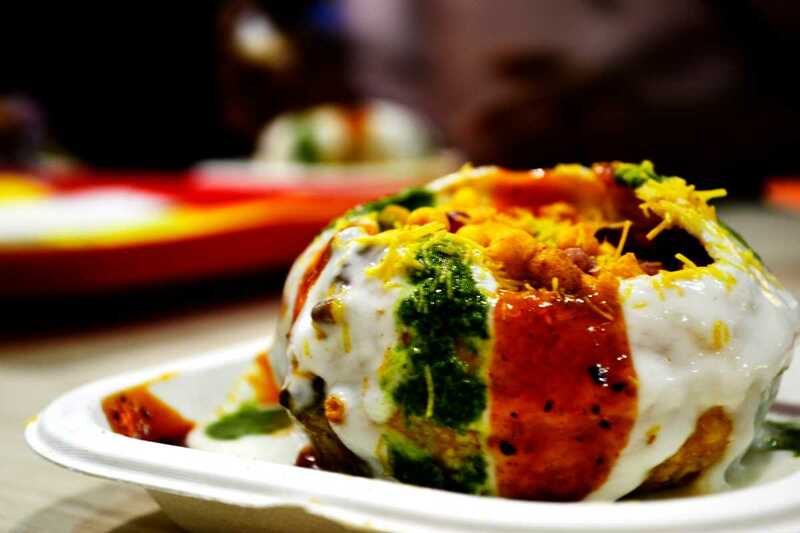 Chaat is among the most ubiquitous items among the street food of the entire country. Allahabad takes pride in its mouth-watering street food and the chaat is just to die for. However, as any Allahabadi will tell you, no one makes it like Nirala ki Chaat. The shop has been making their chaat delicacies for years together and has since become an identifying feature of the Loknath Lane. The best part, however, is that all the items on their menu such as 'Dahi-Sonth ke Batashe', Papdi Chaat, and Phulkis are made from Desi Ghee. This, according to the locals, is what makes all the difference. For a true gastronomic delight, indulging in Allahabadi chaat is a must. The brown and delicious balls of goodness and sweet are an epitome of the sweet tooth that Allahabad's cuisine has. The soft and spongy Gulab Jamuns are made from fresh milk and use recipes that have been developed over the years. As the city swears by tradition, so do its food makers and eaters. The resultant sweet is thus fresh, grainy, dense, and yet soft at the same time. While you are here, don't forget to pack some for back home, they are known to retain their taste and flavour over a long time. There is no doubt that Masala Churmura is among Allahabad's most famous and peculiar street food. While you can find it on almost every street corner in the city, it is best had at Civil Lines. Finding some likeness to the Jhaal-Muri of Kolkata, it is an on-the-go snack made from fresh puffed rice, lime, some spices, roasted chickpeas, peanuts, and of course, chat masala. The resultant mixture is a burst of flavours in your mouth. Just grab some on your way to shopping in Civil Lines and let the taste take care of the rest. No food pilgrimage in Allahabad can ever be complete without a trip to Sainik's in Ashok Nagar that sells the most flavorful and amazing Chhole Samose at Sainik Sweets. The traditional potato-filled samosa is crushed and the spicy chhole are added over it along with curds, some tamarind Chatni, onions, coriander and sev to make this legendary street food of Allahabad. It can be had a snack or even as a meal by itself. Don't try to pack it home though, the real taste of it lies in the hot steaming samosas and fresh chutneys. If your taste buds are burning from the onslaught of hotness and spices from all the food tasted so far, it's time to cool them down with some cold and tangy Dahi Bhalla at Kamdhenu. Bhallas are roundels made from fermented Urad Dal, fried, and then soaked in some water and curds to soften. These are then served with some more sweet-and-salty curds and tamarind chutney along with a bunch of other spices. Although this particular food is available almost everywhere, it is best when had at Kamdhenu. The delicious vadas and fresh yoghurt make for some tasty mouthfuls! A chilly winter morning in Allahabad is often incomplete without a hot cup of tea. There is a stall in the fair that serves tea with a twist. Here, you can have the piping hot tandoori chai served in a kulhad. Sounds interesting, isn't it? What makes this tea different, is the process of making it. Earthen pots or kulhads are roasted in a clay oven at an extreme temperature. Once done, the tea is poured in the pots with some tingling spices. The hot earthen pots add to the unique flavour of the tea and hence the name ‘tandoori chai’. Did you know when Lord Rama went to the exile with wife Sita and brother Laxmana, the royal family used to feed on a drum-shaped fruit known as kandmool? This fruit is one of the best-kept secrets of our country and is often considered the health food of Lord Rama when he was in the forest. The good news is that you can taste this unique fruit in the Kumbh Mela itself. Kandmool looks like a drum with brown coloured skin and its flesh tastes more like the coconut sap. There is nothing like food to give you an insight into the culture of a city and with Allahabad, that adage holds especially true. The eclectic cuisine of the city is sweet, sour and savory with a confluence of multiple cultures - just like the people themselves. It is modern, yet authentic and historical much like the city itself. Most importantly, it is always served with love - just like the hospitality of Allahabad. So go on, get a taste of authenticity with this list of famous food in Allahabad.